Our company is very proud of our long and storied heritage in Brant County. Being woven into the fabric of the community has been key to our success and growth over the past 153 years. When we were first founded, we insured rural risks, but now we are a full-lines rural-urban, regional insurer. Following our philosophy of ‘Neighbour Helping Neighbour’ we provide a helping hand on a daily basis to our fellow community members through charitable contributions. When you put your trust in Brant Mutual Insurance Company you become part of an organization that has been meeting the general insurance needs of this community for the past 153 years. You become part of a solid company guided by fellow policyholders you elect to the Board of Directors. We belong to the Mutual Guarantee Fund, which pools resources of more than 44 mutuals, putting us among the most financially secure insurers in the world. The town of Paris, Ontario was established by Hiram Capron. Hiram not only founded Paris, Ontario, but also the Brant Mutual Insurance Company. Hiram ‘King’ Capron is an icon in Canadian History. 1861 On May 27th, 1861, Hiram founded The County of Brant Farmers Mutual Fire Insurance Company. Hiram brought together local farming citizens to form a group that pooled their resources to help one another in the event of disaster. At that time they only allowed local farmers to purchase insurance ‘notes’ which constituted insurance policies in todays world. The company started with 28 notes issued. 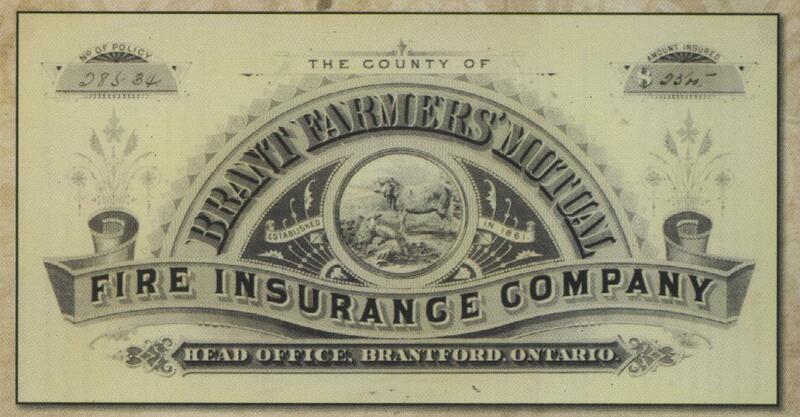 1921 Brant Mutual Insurance Company moved its headquarters to a central location in downtown Brantford in 1921. This move enabled us to provide our services to a wider demographic; helping more people in more places; effectively and efficiently. 1958 As the company continued to grow, it was vital to secure a stand alone location to do business. After 37 years off Market Street, we relocated to 207 Greenwich Street. This location gave the company more room for our growing business. 2010 As day to day business continued to evolve to keep up with the technology era, we followed suit. After years of meticulous designing and planning, in August 2010 we moved our head office from 207 Greenwich Street to 20 Holiday Drive. This new location is centrally located and fully accessible to all of our patrons. 2011 On May 27th, 2011 we celebrated our sesquicentennial anniversary! We are very proud to have reached this historic milestone.